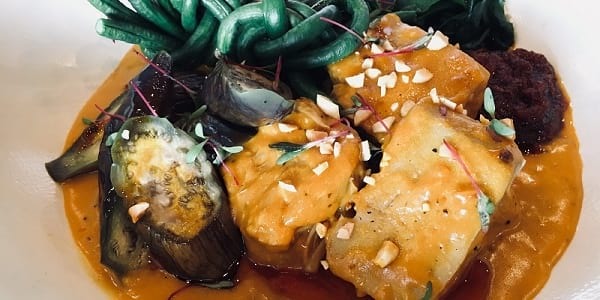 Using langka (unripe jackfruit) as meat substitute, Chef Robby Goco transforms the kare-kare, a meaty homegrown favorite, into a guiltless delicious meal in Green Pastures. 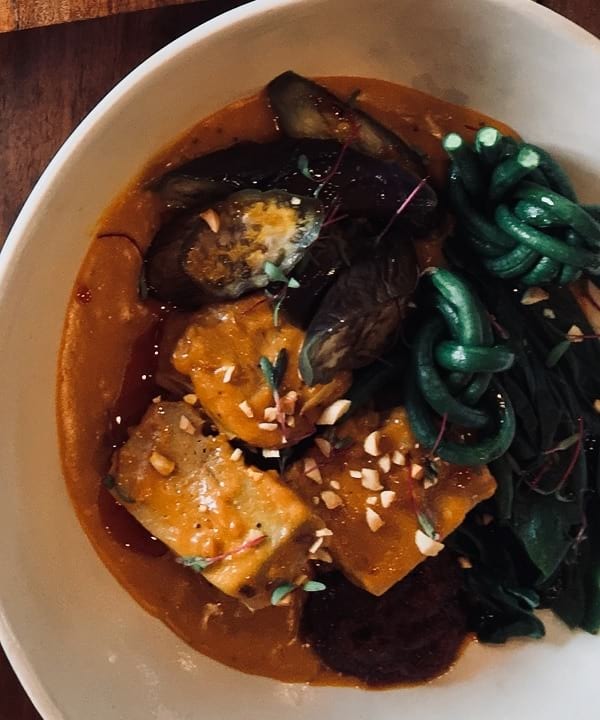 This Jackfruit Kare-Kare is part of the new lineup of Filipino dishes now available at the chef's restaurant that has been showcasing local, organic, and healthy dishes in Manila since 2013. All the new dishes at the restaurant highlight a cleaner, elevated version of some of our favorite traditional Filipino dishes. Think comfort food and flavors that bring us back to some of our favorite family meals, but dishes that use the best local ingredients possible and minus the shortcuts and tricks that often coincide with 'industrialized' food (absolutely no MSG here, and liquid aminos is used instead of soy sauce). 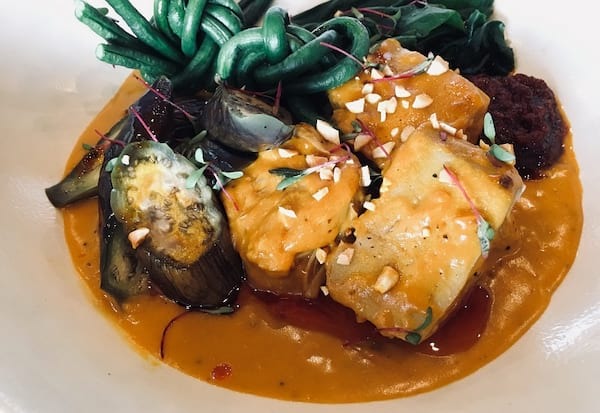 While reading 'Jackfruit Kare-Kare' written on the menu may not make your mouth water, trust on the chef's meatless spin on the dish because it will surprise you the best way possible. 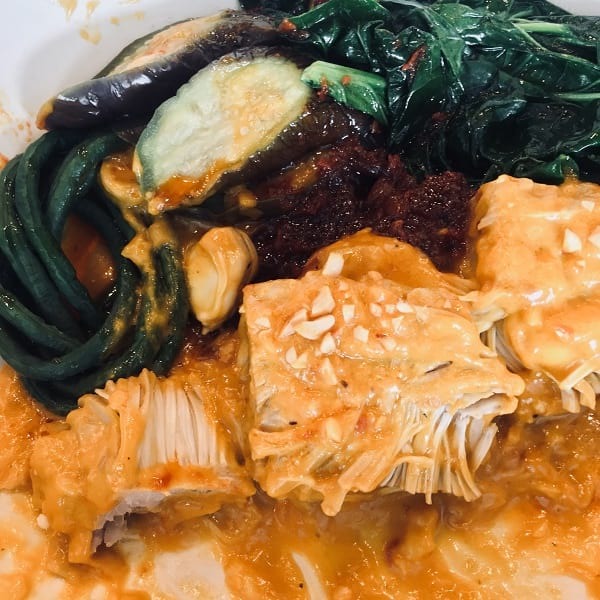 Just like the traditional stew, it comes with thick and savory peanut gravy, sitaw (yardlong beans), and eggplant, and also includes broccoli rabe and a serving of Green Pastures' own garlicky shrimp paste (bagoong). The stew is devoid of oxtail, brisket, and tripe, but this doesn't mean it lacks in flavor at all. 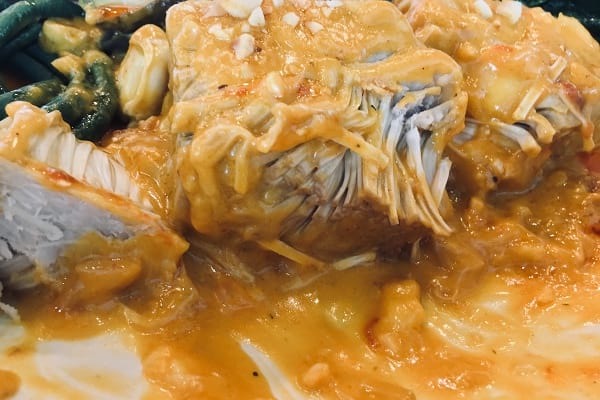 The unripe jackfruit (which we mostly enjoy as a ginataan vegetable dish) enters the picture and submits itself as a willing and able meat substitute for the kare kare. Slice one chunk and you will see its fibrous strands mimic the texture of meat. The luscious peanut gravy works so well with every bite, and the homemade bagoong just seals the deal, adding zings of saltiness in between the rich and nutty flavors. Now all this big bowl of kare-kare needs as a partner is a pile of fluffy white rice to bring you back to memories of celebrations with family. But since this is Green Pastures, after all, your healthier self has more healthful starch options like multigrains (quinoa, adlai, among others) and even cauliflower rice for the carb conscious eaters. Just the right balance of delicious and healthy, don't you think? Where to Find it: Green Pastures, with branches located at Shangri-La Plaza Mall, Eastwood Mall, and Net Park BGC. Follow Green Pastures on Instagram (@greenpasturesph) and Facebook (/greenpasturesph). Eat of the Week dishes out a must-try from a restaurant in the metro every week, so you can add them into your to-eat list. Many of our favorite restaurants have an interesting dish, a new favorite, or that one thing that help put them on the map (and on everyone's Instagram feed). Here, we set out to put the spotlight on a dish you must not miss on your next foodtrip!